Whether you love to cook or you do it out of necessity, electric skillets provide a convenient way to whip up delicious home-cooked meals. These ingenious kitchen tools provide additional stovetop space, act in place of a stove if one isn’t available, and act as buffet servers by keeping food warm. Our experts researched and reviewed the top ten best electric skillets to give you an idea of what’s out there if you’re searching for an alternative cooktop. First, let’s take a look at what makes a great electric skillet. Size: Whether your needs involve cooking for the whole family or quick, small meals for yourself, we researched a range of skillets available in different sizes. Check this spec for the size of each skillet in inches. Lid: You’ll need to know if a lid is included with your skillet selection, which can be important when it comes to certain recipes and foods. Check this spec to determine if your choice has you covered with a lid. Material: Different folks prefer different types of cookware. This spec will tell you what material from which the skillet you’re eyeing is made. Popular options include aluminum, ceramic, and copper. We’ll let you know. Power: We’ve broken down how strong the electric skillets are by determining the number of watts necessary to power up and keep them working. Electricity certainly has made cooking convenient! Check this spec for the wattage on each model. Non-Stick: Non-stick cookware is certainly convenient, but some still prefer cookware that isn’t non-stick. We’ve included this spec to let you know if the skillet you want is non-stick or not, so you can make an informed decision. Dishwasher: Who doesn’t love dishwasher safe appliances? If you can get away with throwing the skillet in the dishwasher after cooking a meal, we’ll let you know. Just check this spec. You’re probably wondering what is the best electric skillet? We did our homework and feel confident showing you the range of options our experts discovered. After careful research and electric skillet review, we compiled a list of the top ten best electric skillets for your shopping pleasure. There’s something for every cook on this list-- professionals and amateurs alike! If you’re looking for a top-notch skillet, you’re in the right place. In a hurry? Check out our top and budget picks. Let’s get cooking! Our top pick has it all and then some! Even better, it folds away neatly when not in use to save space in your kitchen. The Presto features a stay-cool handle, a tempered glass lid, and a non-stick surface inside and out. 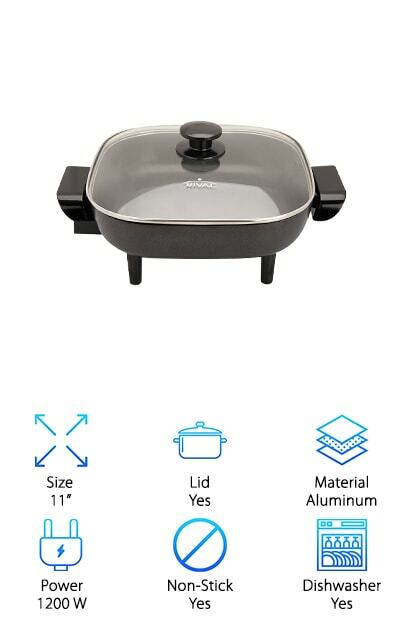 This awesome skillet stays clean and cool, so you can focus on cooking, instead of cleaning or avoiding getting burned. Speaking of heat, this skillet reaches 400 degrees, giving you a wide range of meal options. A convenient built-in spout lets you pour liquids directly from the skillet and serves as a spoon or spatula holder while cooking. With a heavy cast aluminum base, you can be sure you’re choosing a durable model that will last. 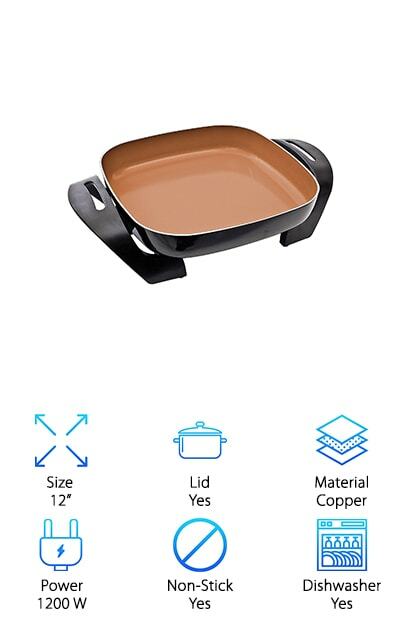 And check this out: when you’re done making your meal, the fold-down handles detach the skillet pan from the base and everything can be stored as a compact, single pan. We think this is the best nonstick electric skillet on the market and it’s available to you at an amazing price! We consider our budget pick the best small electric skillet for one or two-person households. If you’re only cooking for a few, this quality, affordable skillet is perfect! The adjustable temperature control lets you take this skillet from searing, baking, steaming, or frying to buffet-style service. Beyond its versatility and ability to make your favorite dishes, the stay-cool handles keep your hands safe and the tempered glass lid keeps heat inside while cooking or warming. The interior is non-stick, so you don’t need to worry about scraping hardened food when you’re done making your meal. Don’t feel like hand-washing it at all? This skillet and lid can go right into the dishwasher after removing the electric probe. It’s true: this cute, affordable, and convenient skillet is a great pick for singles, couples, and students. But it’s also available in a larger model, if you need more space, too. The Nesco is an all-around great pick available in both 8” and 12”. The Cuisinart CSK-150 is a stainless steel electric skillet that heats up to 450 degrees and offers 18” of cooking space. A control dial lets you easily adjust the temperature, so you can make all your favorite foods just the way you like them! Available in brushed stainless steel with a stainless steel handle and rim, this attractive model is also dishwasher safe, making clean-up quick and convenient. And guess what? The Cuisinart comes with an additional book of thirty recipes as a bonus! The deep pan and high temperature give you a wide range of options when deciding what’s for dinner. You won’t have to wait very long, either, and the pan is quick-heating. We think this is one of the best stainless steel electric skillets money can buy. If you’re ready for top-notch cookware, you won’t want to miss out on the Cuisinart. The best part? 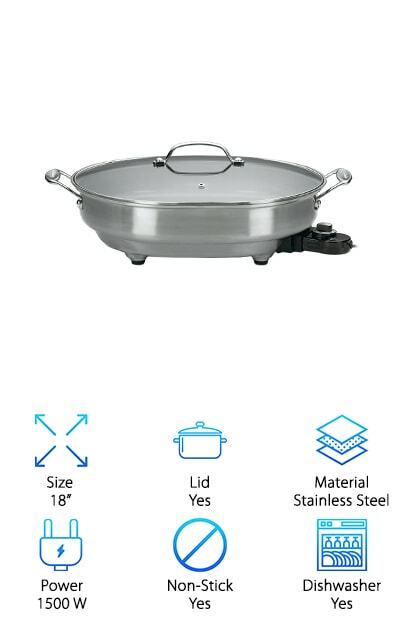 This is a stainless steel electric skillet made in the USA. The Proctor Silex could easily be considered the best electric skillet available because its features meet all your cooking needs. 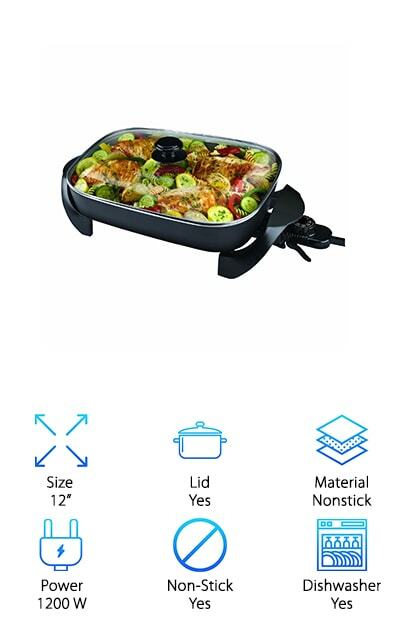 With a nonstick surface and adjustable heat that can reach a temperature of up to 400 degrees, this model makes cooking all your favorites effortless. Dishwasher safe for an easy clean, the nonstick surface will have you wondering if you even need to run it through the wash. And here’s the deal: it doubles as a serving dish, too. Just turn the temperature down and let your meal stay warm until you’re ready to indulge or to serve your guests. The deep, wide pan provides enough room for you to cook for your entire family-- anything from breakfast eggs, to casseroles or steak. You can even fry up some bacon or chicken! Stay safe with the cool-touch handles and glass lid that keeps heat inside the pan. If you’re in the market for an excellent electric skillet, and your mouth is watering, you don’t want to miss out on the Proctor Silex. The De’Longhi model is a popular, top rated electric skillet. What’s the secret? The embedded heating design guarantees a short cooking time without skimping on the quality or taste of the food. Serve up juicy, evenly-heated meals for breakfast, lunch, and dinner and do it in record time! Your family will love the speed and food quality that the De’Longhi brings. 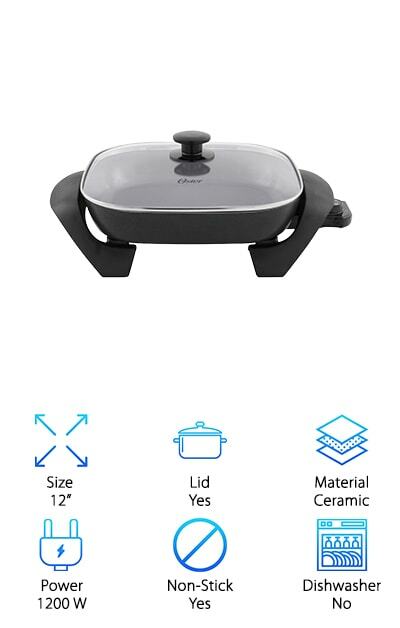 A wide, deep pan, this skillet allows you to cook a large amount of food at once, making it an excellent choice for families or those who like to entertain. Adjustable steam vent holes provide easy evaporation to aid in the cooking and warming processes and keep the pan from overheating or filling with excess steam. The easy-clean nonstick interior keeps you satisfied, even after the meal is over. You don’t have to spend any time scrubbing dried food off the pan! Just unplug the probe and place the entire skillet base and lid in the dishwasher! If you’re looking for the best ceramic electric skillet, you found it. The Oster DuraCeramic is made with an innovative nonstick coating that lasts four times longer than traditional nonstick coating! And check this out, it won’t scrape, flake, or peel! This unique nonstick coating is PTFE and PFOA-free, making it safe for frying and browning meats. But meats aren’t all this revolutionary ceramic electric skillet offers! You can easily make all of your favorites in the generous, 12” dish. Its deep and wide design allows you to cook a large amount at once, making it a top choice for families. The tempered glass lid includes a steam vent and safe, cool-touch handles to keep heat at bay. Better yet, this electric skillet boasts a 20% faster cooking time than its competitors, saving both time and energy. 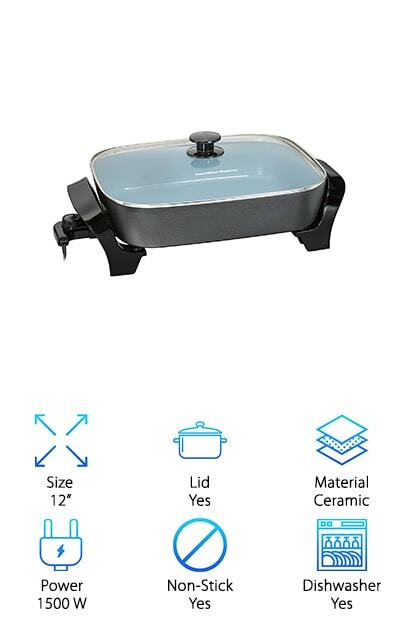 This unique skillet wipes down quickly for easy maintenance and comes to you at an affordable price. The Rival model is one of our favorites and we’re not alone. It has some of the best electric skillet reviews you can find while perusing the Internet. 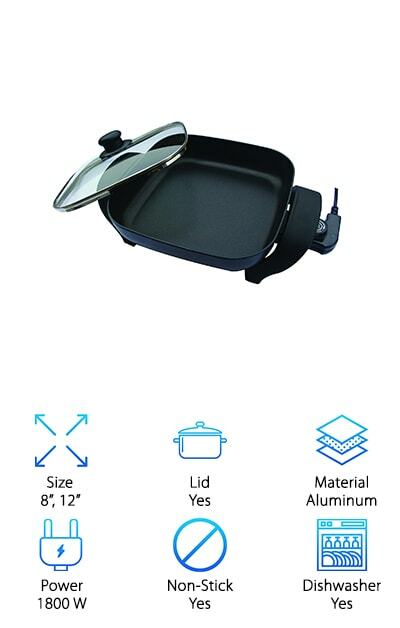 This 11” model features a convenient non-stick cooking surface that works as both a hot skillet and a warming buffet server. Adjust the temperature to your liking with the control knob, so you can cook up all your favorites and then bring them to the table to serve to your family or guests. A tempered glass lid and stay-cool handles keep your food cooking evenly and your hands safe when it’s time to transport the skillet. Dishwasher-safe after the electric probe is removed, this skillet is easy to wipe down. Set on four legs, the skillet rests at a convenient cooking height and won’t burn your countertops. It’s the perfect size for a couple or small family! Don’t miss out on this great skillet, available to you at a friendly price. Designed with a durathon ceramic nonstick coating, our experts think the Hamilton Beach Deep Dish might be the best electric skillet on the market. Four times more durable than traditional nonstick material, this skillet won’t crack, scrape, or peel! Best of all, it’s PTFE and PFOA-free, making it a safe option for cooking and frying all your favorites. Steam, sear, bake, fry, and braise with this extra roomy, elite model. The wide, deep design allows you enough room to cook for the whole family or a group of guests. Adjust the temperature via the removable electric probe to reach up to 400 degrees for a range of cooking options. Turn down the heat to make the Hamilton a convenient server and take advantage of the stay-cool handles to move it wherever you choose. After you’re done, you can easily wipe this skillet clean or remove the electric component and pop both the base and lid in the dishwasher. 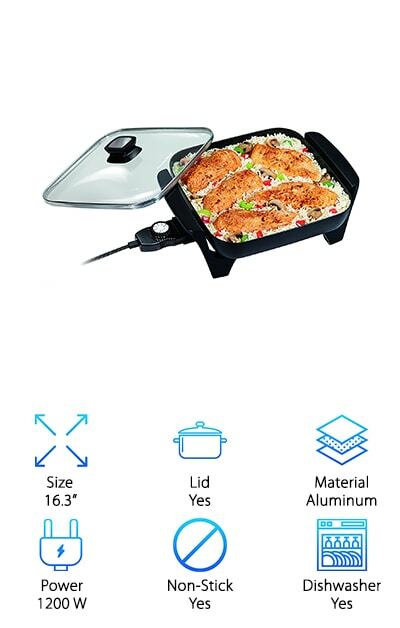 With a temperature that reaches up to 450 degrees and a wide, deep basin, the Bella could easily be considered the best electric skillet for frying chicken. The beautiful copper titanium lining lets you roast, bake, saute, steam, and more quickly and efficiently. In fact, the durable inside coating is resistant to heat for up to 850 degrees and is PTFE and PFOA-free for a healthy, safe cooking experience! The nonstick coating is eight times stronger than traditional nonstick surfaces, ensuring that all foods wipe off for an easy clean. 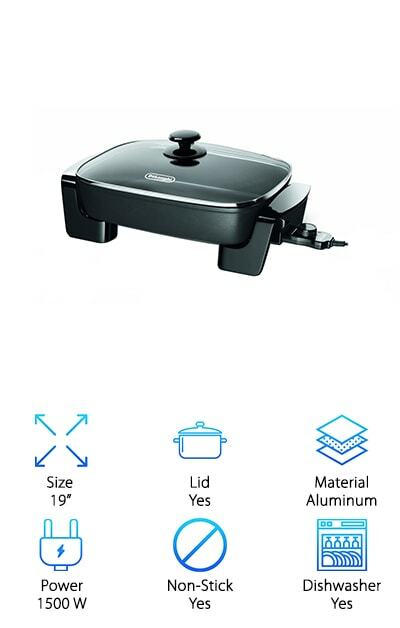 Even better, it cooks 30% faster than other electric skillets! And you can turn down the heat to serve your family or guests buffet-style wherever you choose. When you’re finished making your meal, the skillet immerses in water for a simple, fast clean. The tempered glass lid is dishwasher safe. If you’re looking for a best rated electric skillet, look no further than the Black & Decker. 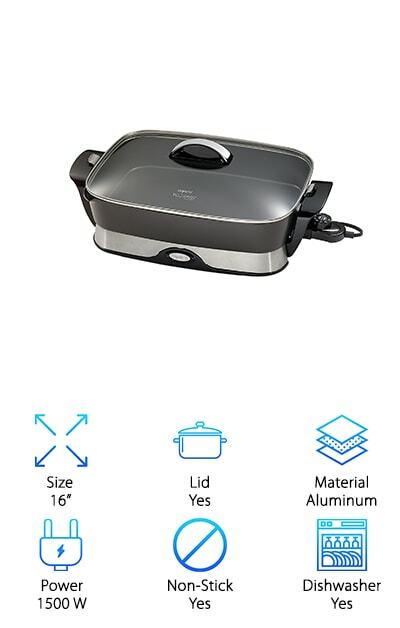 A trusted, reliable brand, Black & Decker delivers a convenient, efficient skillet large enough and perfect for cooking meals to fill the whole family. The 12” inch deep cooking surface, dial control, and stay-cool handles make for great buffet-style service. When you’re all set in the kitchen, simply move the skillet to the table and let your guests or loved ones serve themselves a hot and fresh meal. Easy-to-clean and dishwasher-safe, you get a time and energy-saving model when you choose Black & Decker. And check this out: excess fat can be removed from the pan tilt leg to remove oils and fat from your meal. When you’re in the market for a great skillet at an affordable price, Black & Decker is an ideal choice.